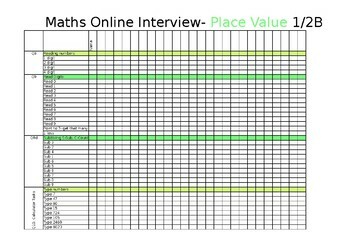 Designed to be used with the Mathematics Online Interview (Vic, Aus), these profiling sheets making tracking and handing over your data easy. Each question is broken down into all of the different sub-questions, in an easy to follow format. As you are interviewing the student, simply tick the correct box when a student has met the criteria to show that achievement. Each section is colour coded so you can see at a quick glance what page you have open. I have left the file open for edits so that you can add in your class name and names of students. 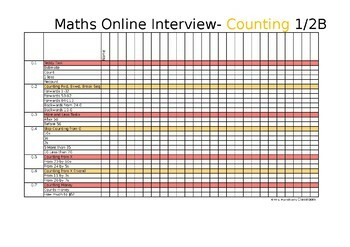 At the end of each section, there is a table so you can quickly match up growth points with the curriculum, and get a brief rundown of where your student finished in that section and what they are working towards achieving. 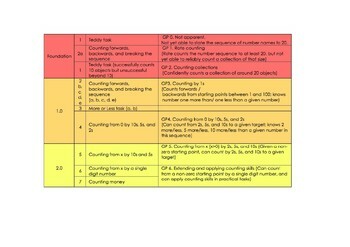 This profile is a big assistance when writing reports, as you can clearly see what each student is able to do. Handing over end of year data to new teachers is also a breeze, as even if they are teaching in the middle or upper years, they can still follow the data and understand what the student is capable of. If you have any queries about this product, do not hesitate to contact me.